Palmer Luckey says VR needs to incorporate touch-based feedback to further the feeling of immersion and wonders if some day we’ll think it’s wasteful to actually get on a plane to meet people in the real world. 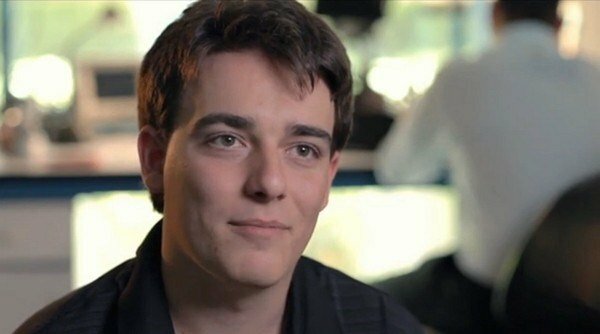 Virtual reality headsets like the Oculus Rift must expand beyond visuals and allow for touch-based human-to-human interaction, creator Palmer Luckey said in a new interview from PAX East in Boston, Mass. All of this is in the way of creative a fully immersive experience that makes you feel like you’re really in a “virtual reality,” Luckey said. The objective of this summer school is to propose a privileged moment for stimulating discussions and exchanges around Virtual Reality. Meetings will be organized around talks, workshops and social events. As for every summer school, PhD students are invited to come to present the progresses of their research works, challenges and corresponding solutions they put forward. We also encourage Master students to participate. Within these privileged moments, we hope to be able to stimulate European collaborations around Virtual Reality leading to new European projects proposals (Horizon 2020). We observe several evolutions of research axes of scientific community in Virtual Reality. Among these evolutions, 3D worlds have become very realistic nowadays and a lot of research has been focused on 3D interaction these last years, with specific interests in natural user interfaces and tangible interfaces. Since interaction is closely related to perception, sensory interfaces are continuously evolving for a perception that is now multi-sensory. In the same way, systems, such as virtual human or robot, senses, communicates and interacts. Technology that could bring R2D2’s projection of Princess Leia in Star Wars a step closer has been developed by a University of Bristol research team. 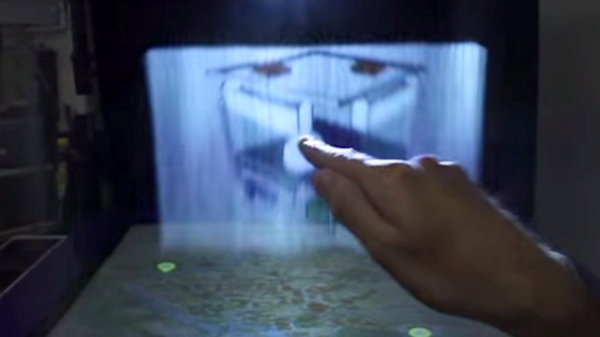 The MisTable uses a set of vapour curtains as interactive projection screens to display computer images. The team will present their development at the prestigious ACM CHI 2014 to be held at the Metro Toronto Convention Centre between 26 April and 1 May by the Association for Computer Machinery (ACM). Attendees at the computer-human interface (CHI) conference will see how the table uses two fans above and below the edges of a tabletop display to create thin walls of mist which are used as screens. The medium is a mixture of glycerine and water vapour similar to the rolling mist effects used in theatrical productions. According to the developers, the vapour is dry and does not wet the hands of the users. ACE – the leading scientific forum for dissemination of cutting-edge research results in the area of entertainment computing is inviting the submission of papers, posters, creative showcases, and workshop proposals to its 11th conference to be held in Funchal, Madeira, 11-14 November, 2014. 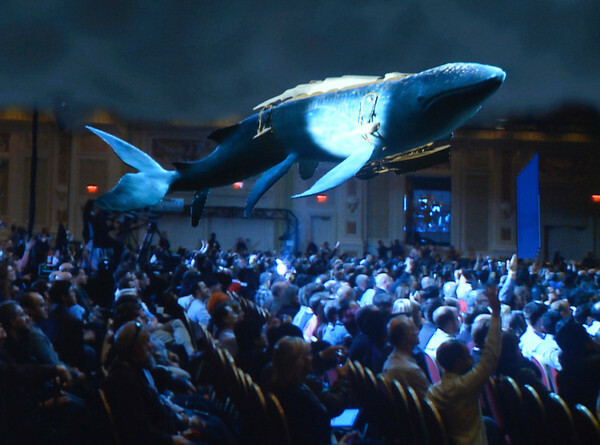 This past January, in collaboration with Intel Labs, the USC School of Cinematic Arts World Building Media Lab unveiled “Leviathan,” at CES 2014’s Intel CEO Keynote speech. As the audience used Intel Ultrabooks and tablets to simultaneously control flying jellyfish creatures that swam alongside the eponymous augmented reality behemoth, Leviathan soared off the screen and into the crowd, yielding an as-of-yet unparalleled mixture of film and gaming experience. “Immersive storytelling” doesn’t even begin to describe it. 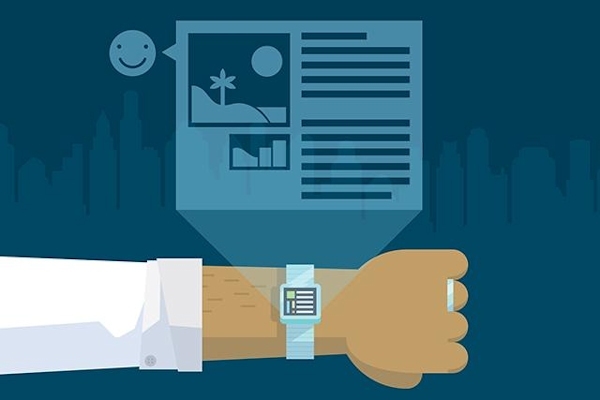 Mobile technology offers significant potential to connect users to their immediate geographic environment. Yet existing approaches to doing so are largely visual, which can isolate users from that environment, and utilitarian, such as directing a user to a destination or showing nearby coffee shops as a list. The recent rise of geo-social media (images, text updates and check-ins) has offered new ways to support contextualising the environment and connecting users with it. Work such as PULSE (that presents geographically nearby tweets as audio), Columbus (that allows the rediscovery of photographs taken in the nearby environment) and HotCity (that uses check-in data to create context-sensitive heatmaps to show tourists the socially active areas of a city) have shown how this media can be used to provoke and engage users with the environment through mobile technology, without isolating them from that environment. The workshop will take the form of a “challenge”. To support the challenge, we will provide an historical social context dataset from three cities: Oulu (FI), Glasgow (GB) and Patras (GR). Oulu and Patras are relatively small cities (~200K people), Glasgow is mid-size (~600K). These datasets provide publically accessible data about the city-centre areas based on the Foursquare, Facebook and Google Place datasets (e.g. when and where people check-in, likes and tags of locations etc. ), collated over several months. A RESTful API on historical social media use will be provided on the workshop webpage. To obtain access to the dataset and participate in the challenge, participants should email an (up to) 4-page CHI EA format abstract in pdf format to the organisers. This should clearly articulate a position relevant to the workshop. It should also briefly describe a proposed prototype (installation, artefact, app or other system) that illustrates this position. Note that submissions may use other data sources as necessary, and are not required to use the dataset provided. A document describing the dataset in detail is available on the workshop webpage (www.urban-context.eu). The first of a three-part series of reports from travel comparison site Skyscanner called ‘The Future of Travel 2024’ was revealed at an event in London today, looking at what leisure travel will be like in 10 years’ time. The report predicts the rise of what it calls ‘Digital Travel Buddies’, a virtual companion which uses artificial intelligence to accurately suggest and book suitable trips for the traveller. Using semantic search, which seeks to improve search accuracy by understanding user intent, online tools will help travellers book bespoke trips based on their responses or even through facial coding algorithms that will enable search engines to read and react to human expressions and adjust results based on the user’s response. This year the Insight Centre for Data Analytics will be hosting the 8th Annual Irish Human Computer Interaction (iHCI) conference in the Helix, Dublin City University on the 1st and 2nd September 2014. iHCI is Ireland’s leading forum for work in all areas of Human Computer Interaction bringing together practitioners, academics, researchers and students from a wide variety of disciplines including user experience designers, information architects, software engineers, human factors experts, information systems analysts, social scientists and managers. We also welcome perspectives from design, architecture engineering, planning, social science and creative industries among other disciplines. The conference theme is “Shaping our Digital Lives” which reflects how technology influences our home, work, play, and life, and the challenges in designing and deploying innovative and collaborative technologies which shape our lives. For years, different kinds of cameras have acted as smart mirrors for vehicles, helping drivers better see what’s happening behind them. 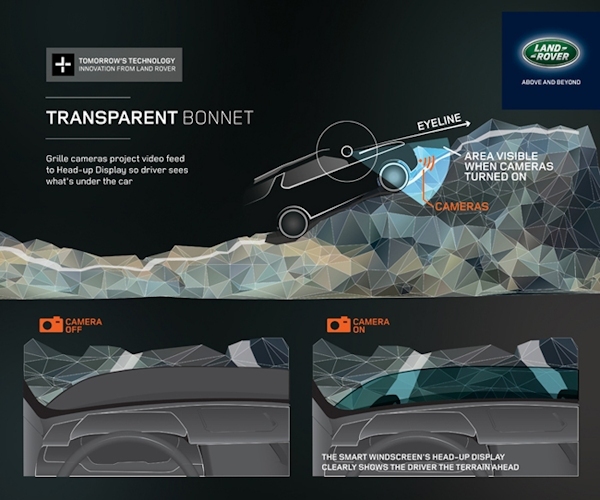 Now luxury SUV maker Land Rover is expanding on that idea, incorporating a camera under the hood to help drivers better see what’s happening right in front of them. 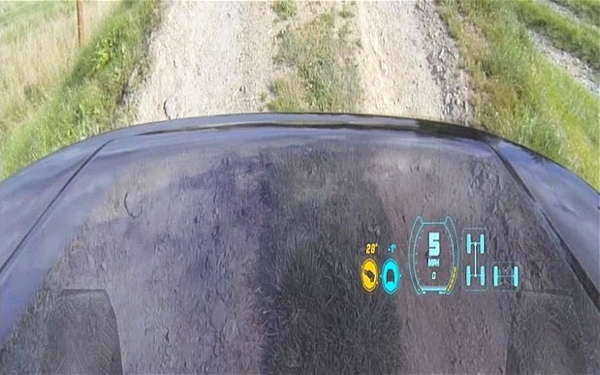 The technology is called the “Transparent Bonnet,” and it overlays a camera feed onto the inside of the vehicle’s windshield, making it simple to see what would normally be the unseeable space below and just in front of the hood. This means that, unlike most vehicle camera tech of today, the driver needn’t look anywhere but straight out the front window to observe what’s happening in the sight of the cameras. In this workshop, we aim at outlining the “design” aspects of auditory displays and sonification. Research has proposed that multiple populations (e.g., visually impaired or blind people, children, older adults, etc.) can benefit from auditory displays and sonification. Well-designed auditory displays and sonification can supplement or replace visual displays to enhance user experience and accessibility. Despite the increase of research on auditory displays and sonification, auditory displays and sonification have been still treated peripherally and sporadically in industry and academia. Further discussion is required to have a general consensus among researchers and practitioners about the standardized design framework and approach. There have been recent attempts at ICAD to define sonification as a scientific project and to accept only research carried out using the scientific method. Based on this background, the goal of the present workshop is to examine the current status quo of the “design research” of auditory displays and sonification in terms of both theory and practice. If we agree that sonification is a purposeful mapping between sound and meaning or making an organized sound from the semiotics perspective, all the processes of mapping and organizing sound could belong to design research. To refer to design research in the auditory domain, we coin the term “sonic information design”, including auditory displays, auditory user interfaces, and sonification, etc.